This is an Alice and Wonderland cake that I made for a 6 year old's birthday. Inspiration was easy here! With Alice and Wonderland being a childhood favorite- inspiration was all around me. I wanted to incorporate the Chester Cat, painting the roses red, cards, the eat me message, and the wonderful pastel colors from the movie that are so friendly for a 6 year old birthday cake. 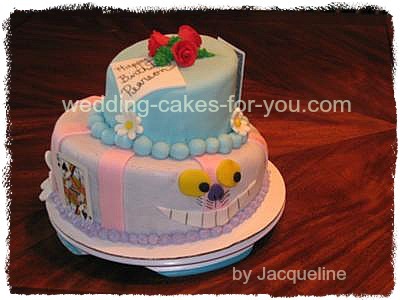 I decided to make it a topsy turvy cake with the bottom tier being the Chester cat face, the top looking like the candy that Alice ate in the beginning of the movie that made her grow and shrink, and then added decorative features from the movie like daisy's, roses, cards, etc. The first thing that I did in terms of decorating was to start making the daisies and Chester Cat face when the cakes were in the oven. This allows them to be ready when it's time to decorate the cake, literally saving you an hour! I made the daisies by using a Wilton flower cutout and putting them in the Wilton shape bowls. I then put a small ball of yellow fondant in the middle of each flower. Once hardened, these flowers will have the perfect shape. I then rolled out handful of fondant and by using a fondant cutter cut out the Chester Cat's mouth. Set aside. After hardened take a Food Writer black marker and draw on the teeth. I then rolled out a small piece of yellow fondant, black fondant, and dark purple fondant. Take a medium sized circle cutout and make the large yellow eyes. Use the small circle cutout and make the black pupils. Put the black pupils on the yellow eyes. Set aside. Take a small piece of the purple fondant and make the nose. After hardened a bit take the black Food Writer marker and draw on the nostrils. Once you cover the bottom tier with light purple fondant, use everything you made and decorate away! On the top tier, roll red pieces of fondant to make the roses. Cut out a square piece of fondant for the happy birthday note and set in a large Wilton Shape bowl. Let sit. After formed, then write the birthday message with the black food writer. This cake was strawberry with an amazing chuncky white chocolate icing. Microwave white chocolate and cream in medium bowl on high for 1 1/2 minutes until chocolate is almost melted, stirring halfway through heating time. Stir until white chocolate is completely melted. Cool to room temperature. Beat butter and sugar gradually into cooled mixture on high speed until light and fluffy. Work it! Growl like a tiger! ha ha. I honestly feel like I created a priceless piece of art. When I dropped the cake off the mother of the 6 year old started crying. She said that it exceeded all her expectations. It was a proud moment. Wow Jaqueline! You should be proud because your Alice in Wonderland cake is fantastic! Your story is wonderful and the instructions and recipe is an added plus to your entry. Thank you so much for entering and taking the time to write up a great page here. I love the unique features of this cake, it's creative, fun and looks so yummy! Love the cake. What's weird I had a dream about the cat last night. you should definitely win. Now I know who to call for cool cakes. As a fan of the book I love the inspiration!! Wish my mom would have thrown me a rockin' Alice party at 6!! Don't know what to say except that the cake is beautiful, fun, and something anyone who is a real kid or a kid at heart would love. I prefer chocolate but it sounds good anyway. Love the topsy part of it too and of course the Cheshire Cat grin!!! In 3rd grade my class performed songs from Alice in Wonderland for our parents...looking at your gorgeous cake brought bake how much fun all those songs were to sing! Congrats on the cake. I love all the details...and I've had your cupcakes so I know this cake would be tasty too! i love love love this cake! it's so adorable and totally captures the spirit of "Alice in Wonderland". would love to have this cake for my little girl...or for me! I am so impressed by the flawlessness and the originality of the cake! I never thought you could incorporate everything from this childrens story but I was proved wrong!!! I like how you added the recipe too! 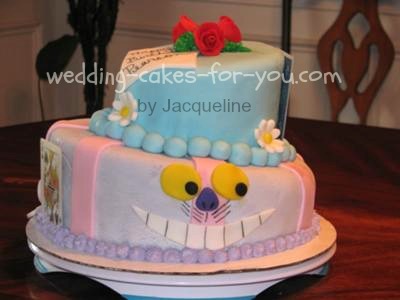 I love the Alice in Wonderland cake. The design, the colors, the touch of whimsy. It makes you smile to look at it! I am a grandfather now with a little granddaughter. Seeing the eyes light up when she sees something like this is just priceless. One of the great joys in life. Brings me back to my earlier years with my beautiful twin daughters. Sharing special birthdays with special parties and cakes was always a great treat for me. Jackie, what a fabulous job. I am sure you made a little girl very happy on her birthday. I just LOVE this cake. At first glance you know it is an Alice in Wonderland theme! The Cheshire Cat is perfect. I love that she took so much time and effort personalizing it. The colors are wonderful and capture the whimsy of Alice in Wonderland. Beautiful job. That cake is absolutely beautiful! Great job!! I certainly understand the mother crying when she saw this spectacular birthday cake created especially for her child. The imagination and creativity that was necessary to design, bake and decorate this cake is unbelievable! This is truly one of a kind and amazing! This cake is beautiful and any child would love this cake! Amazing job!! Such a great cake!! Great job and would be perfect for a Alice in Wonderland theme!! I am very impressed with this beautiful cake! It looks like it was made on Cake Boss! I did not know you had this great talent! This Cake is GORGEOUS!!! Very talented and what child would not love this cake! I LOVE IT!!! Amazing job on this cake. Love the colors and how topsy turvey it is. Jackie ~ your cake is amazing. You should be very proud of yourself. Love it! I not only get the honor of seeing the finished product, but I get to watch as Jackie builds these amazing cakes. She honestly pours her heart and time into making perfect cakes for any occasion. This one was for a little girls birthday party and I am sure that it is one that she will always remember. Jackie, this cakes is beautiful just like all the others that you create. Cake looks amazing! Great job!